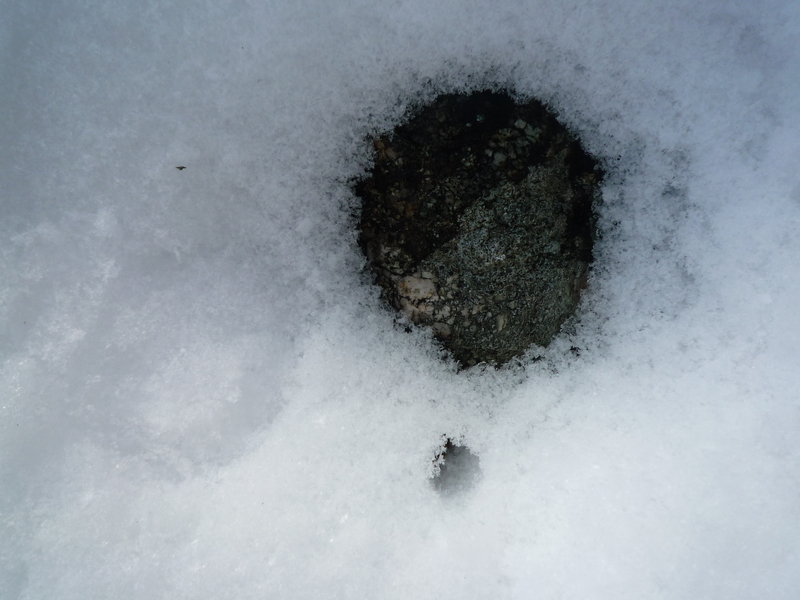 Yesterday our first real snow fell. Pete had a friend spend the night, and as soon as they finished breakfast I rummaged through our winter gear to outfit them both with boots, mittens and snow pants. They’ve now been outside for a couple of hours; romping and tossing snowballs at each other and at David, who is shoveling the driveway. 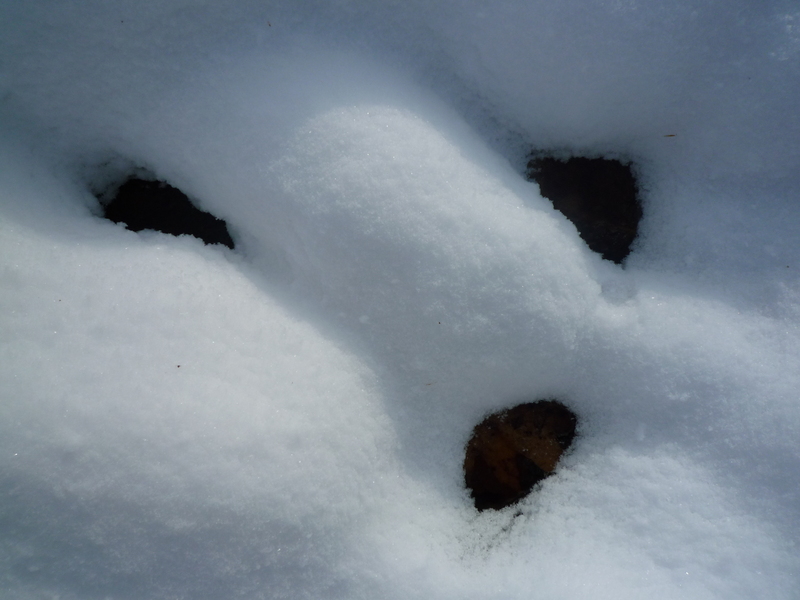 I tromped through the snow as well in order to take a few pictures of the snow on the ground. Undoubtedly there will be plenty more of this where that came from, but the first snow is always an occasion for celebration. David and Jemesii made it back from Texas late Friday night, after a hectic day of delays and missed flights due to the unusually wintry weather they were having in Texas. 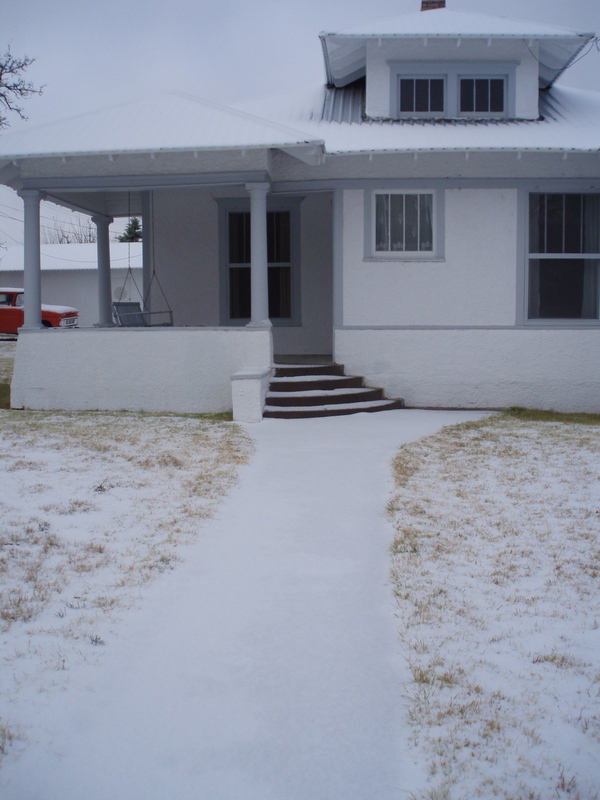 I had asked David to take some photos of our house and the snow in Marfa, and he brought back some great ones. Some day I would like to be there during such an event. Here at home we are finally returning to a semblance of routine. We really had to hit the ground running upon our arrival, but after a hectic few days, we are sorting it all out. On Thursday I drove to Boston for my monthly appointment with Dr. Shaw and to pick up my supply of PF-02341066. She told me that Phase III of the trial would be officially starting this week. We discussed the fact that the hospital (MGH) has once again been inundated with requests for information as well as testing for the ALK mutation. And of course, we marveled at my continuing good health. It is all very exciting: to know that others are discovering that they have the ALK mutation and that they may be eligible for the trial. And that these individuals, just as I have, will likely regain both a period of better health and greater hope. After my appointment, I went to Whole Foods to grab some lunch. It was high noon and quite crowded. When I attempted to sit in what appeared to be an empty seat, I was told by a woman and her friend that they were saving it. I sat on the other side of the table, and when a young girl approached the seat I had just been turned away from, I told her that I thought it was taken. That seemed silly of me, and I turned to the woman to my right and said “I guess that isn’t my job, is it?” She concurred, and when the next person came to the table, I said nothing. Well, it turned out to be a rather lucky turn of several events. After perhaps five minutes, the woman who had just sat down across from me made an offhand comment that we were the two quietest people in the very noisy store. I agreed, and we began to converse (quietly). Somehow this conversation led to the fact that we had both been diagnosed with lung cancer. Remarkably, it had been 24 years since her diagnosis. I was elated, as I am always “looking” for long term survivors, and frankly I had never heard of anyone who was 24 years out. I told her how inspiring this fact was to me, and then we exchanged contact info and agreed to meet for lunch on one of my trips to Boston. So you see, never say never. It does snow in Marfa on occasion, and there are long term survivors of lung cancer. I feel honored to have made the acquaintance of one. This entry was posted in Connections and tagged long term survivor lung cancer. Bookmark the permalink. I always get a big encouragement from your blog, Linnea. Thanks for writing. Never say never. It’s one of my mantras. I read your posts for the first time when it popped up from my Marfa “google alert.” I have enjoyed the photographs. Then I started reading your posts, and was taken in immediately by your excellent writing. Because of it, you are a real person to me, and I can only tell you that you have brought much comfort to others with your story. I am curious how you and your family became connected to Marfa – and to that wonderful cozy house covered in snow in the last picture you posted! – i.e., if you are Texans, or if you are artists, or how you found that special place, which I hope to visit in the near future. Sending you sincere best wishes and thanks for your writing; I will be following your story. Kristen, thank you! I first discovered Marfa in an article in Art News maybe eight or nine years ago. I had been going to Texas for years to visit family, but had never heard of this cute little town. Six years ago my father Ollie, who was living in San Angelo, Texas, planned a trip to Marfa for the two of us and my sister Bink. We toured Chinati, saw the Marfa lights, and drank margaritas on the balcony of our room at the Paisano. It was a magical trip, and I was smitten: so much so that my husband David wanted to see Marfa as well. Almost five years ago we acquired the house in the picture–coincidentally just as I was diagnosed with lung cancer. At that time I was uncertain how many chances I would have to return to Marfa, but thankfully there have been many (but frankly, never enough!). And yes, I am an artist (well, at least some of the time). I do hope you go to Marfa as well; I can’t imagine that you will be disappointed. Thanks for your note, and that history. I have TX connections, too (historically via great-grandparents, and grandparents, and one “oil lawyer uncle” who loved Texas; currently via Austin cousins, and Houston nieces and nephews). Over the past 10 years I visited Texas for job reasons related to the U. S. – Mexico border, and also for personal reasons (trips to LBJ territory, hill country etc). Do you live near Boston? I have sisters in Carlisle and Waltham. I live in San Diego, however. Two sister have gone through something similar to your journey but with breast cancer: one was very young (42) and diagnosed before lots of the new developments in treatment, and sadly died 15 years ago; my older sister was diagnosed recently, it was early, was treated brilliantly in Seattle, and is doing wonderfully now. Just thought I would mention that link, too. 🙂 Thanks for answering, and I’ll be thinking of you! Hello again, Linnea, I finally got to the website. It is quite wonderful and just another reason I am so glad we were both sitting in that space at Whole Foods last week. I have only read a little so far, but look forward to reading the whole blog- and also to our next lunch, which will, of course, also be meant to be. 🙂 I toast us and all the other survivors out there with a Fiddler on the Roof toast: L’Chaim! To Life! Hi Linnea, I began reading your blog after you posted information on cancergrace.org. I just learned that I have the alk mutation. I see my doc at DFCI on Fri to begin the process of enrolling in the trial. The timing couldn’t be better, after 20 months of various treatment for stage IV lung cancer and a recent scan that shows disease progression, I was all too aware that my options were running out. And now, I am hopeful once again. I am 54, a nonsmoker, and I worked in oncology as a nurse practitioner until I was diagnosed. And yes, there are long-term survivors out there. I’ve cared for quite a few!